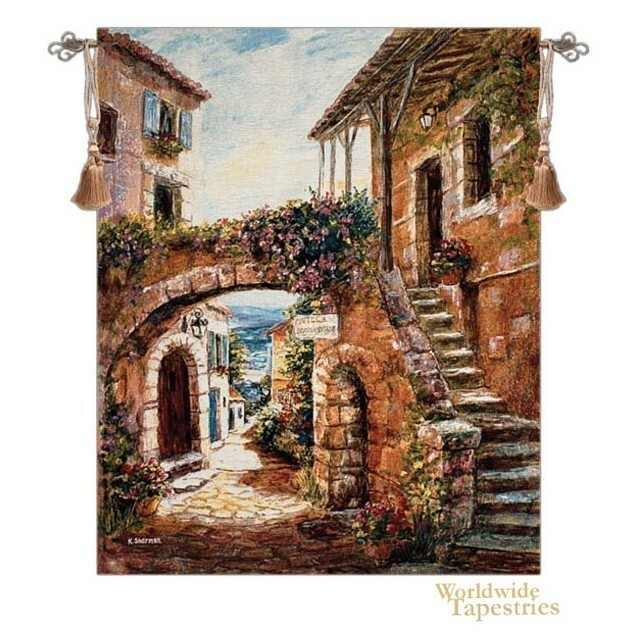 This wall hanging “Walk Back In Time” shows a lovely cobbletsoned street in the Mediterranean, the artwork of Kathryn Sherman. Here we see the detailed stonework of the village, decorated by colorful flowers, leading the eye to the distant hills in the distance. These nooks and alcoves in Italian villages have been an inspiration for artists in ancient times as well as modern, and this rendition shows the charm that is the appeal of these unique towns. This tapestry “Walk Back In Time” is lined and has a tunnel for easy hanging. Note: tapestry rods and tassels, where pictured, are not included in the price.